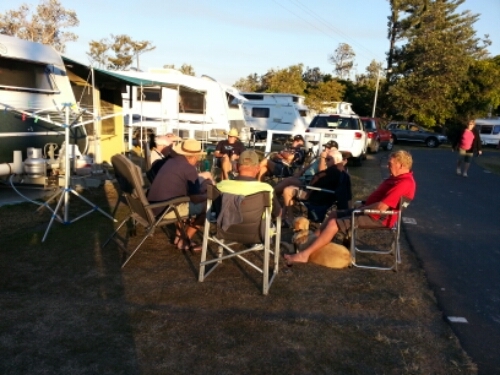 It hasn’t taken long to lose track of the days and to accept what nature presents, nestled under some trees just over the dunes in a caravan park in Woolgoolga. So far we’ve been blessed with crisp nights of 7 degrees and sunny days of 23 and light winds. I have never enjoyed the beach much but on arrival I forced myself out there on the broad sands three times a day, at first purely for tiring out the dogs; worried they’d bark at strangers or from anxiety at the new surroundings and get us booted out. But as this threat receded I found the gentle surf, the salty lake, the casual fishing and retiree camaradarie alluring and unexpected. So this is the Australian surf lifestyle we’re always hearing about, which seems so alien to Melbournians. According to my father in law, July is peak season when the Mexicans flee north and fill the north coast for 3 or 4 months before doctor’s appointments draw them back. The vans are mostly spotless, annex ropes crisply pegged and lined up, a clean, modern 4WD adjoining. When the weather doesn’t provide, TVs, Smartphones and Oil heaters fill the gap. Dogs are in every second van, poo on the ground non-existant, and blokes mop their own showers at the hint of dirt underfoot. Not saying hello to anyone sitting out front or walking along your row is a big social faux-pas which feels forced and unnatural at first. Clusters of ladies sit in the sun and sew or knit and make small talk or plans for a group lunch in a few days. People invite couples into their annexes for a glass of red at dusk. It’s very agreeable really. And if you want some major shopping excitement? – Head into Coffs for the morning… so far I haven’t bothered. Having a wonderful time and so are the doogies.